According to the Civil War Soldiers and Sailors System Lieutenant Philbrook served in the 8th Illinois Infantry prior to transferring to the 5th U. S. Colored Heavy Artillery. He was assigned to Company B, and his rank in is listed as 1 Lt. & R.Q.M. Lieutenant Philbrook had 2 brothers who served in the Civil War. 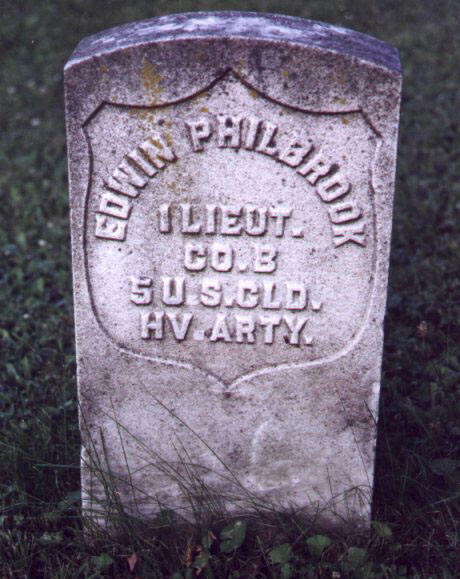 Sergeant Albert Philbrook, 14th Illinois Cavalry, died at Andersonville, and Private Flavious J. Philbrook who served in the 115th Illinois Infantry. Organized from 1st Mississippi Heavy Artillery (African Descent). Designated 4th United States Colored Heavy Artillery March 11, 1864, and 5th Heavy Artillery April 26, 1864. Attached to 1st Division, United States Colored Troops, District of Vicksburg, Miss., to February, 1865. Unattached, Post of Vicksburg, Dept. of Mississippi, and Dept. of the Gulf to May, 1864.